A lane, which was closed on the M61 following a two-car crash, has been re-opened says Highways England. The accident happened at around 9am on Monday on the northbound carriageway between junctions 8 and 9 near Chorley. One car is reported to have ended up facing the wrong way on the motorway and traffic officers warned drivers to approach the scene with caution. 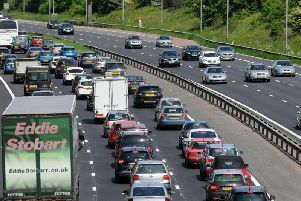 A spokesman for Highways England said: "We were called to a two-car collision on the motorway. "One lane was closed but the others remained open so the impact to traffic has been minimal." Nobody is believed to have been seriously injured in the incident.